Plant-based diets have been shown to decrease the risks of many of our chronic diseases including cancer, diabetes, obesity, and heart disease.- Heart disease is the leading cause of death in the United States and throughout the world. In fact, a plant-based diet is the only diet that has shown reversal of heart disease. My favorite definition of a whole food plant-based diet is one that “encourages whole, plant-based foods and discourages meats, dairy products, and eggs as well as all refined and processed foods.” It is important to highlight the last part of this definition where it says to avoid “all refined and processed foods.” Just because a particular food originally comes from a plant, like French fries for example, does not mean it is necessarily healthy. Due to this increased knowledge of the health and environmental benefits of a plant-based diet, many companies are developing “plant-based products” which, although taste good, are not much different than the processed SAD (Standard American Diet) and should be avoided. Just last year, an insightful study was published in the Journal of the American College of Cardiology from researchers at Harvard, which looked at the intake of specific types of plant-based foods and the risk of developing coronary heart disease. 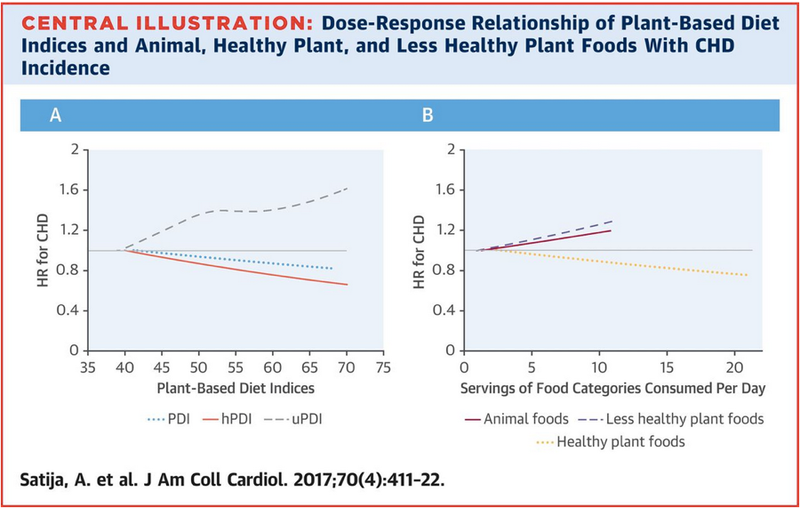 They note the positive research supporting plant-based diets and reducing the risk of cardiovascular disease but they acknowledge some of the confusion around the definition of plant-based and/or vegetarian diets. Therefore, they formulated a study including over 70,000 women in the Nurses’ Health Study, over 90,000 women in the National Health Survey (NHS2), and over 40,000 men in the Health Professionals Follow-up Study, all over a 20-year time frame. Researched followed participants in these studies who were initially free from disease. Using food questionnaire data, they assigned positive scores to healthy plant foods such as whole grains, fruits and vegetables, nuts and legumes; and they assigned negative scores to less healthy plant foods such as sweetened beverages, refined grains, fries, and sugary sweets. The authors also assigned negative scores to the ingestion of animal products such as meat and fish. Participants were then scored on a spectrum according to their individual diets: overall plant-based, healthy plant-based, or unhealthy plant-based. What did they find? With over 4,800,000 person-years of follow-up information (that is a lot of data! ), they recorded over 8,000 episodes of coronary heart disease (such as heart attacks). They found that in general, when people adhered to a plant-based diet, their risk of suffering a coronary event was significantly decreased compared to those who did not follow a plant-based diet. We already know this. But what we didn’t know comes next. When people followed a healthy plant-based diet, their risk of heart attack was further significantly decreased. However, when people followed an unhealthy plant-based diet (refined grains, fries, sweets, etc…), their risk of having a heart attack was just as high, if not even a little higher, than those who consumed animal foods! See graph below from their paper. The hazard ratio (HR) for developing a coronary heart disease event (heart attack) was highest among those who consumed unhealthy plant foods. The group that had the lowest risk of developing a heart attack were those who consumed healthy plant foods. There has been an explosion of imitation animal products that taste like meat or some other type of animal product but are merely processed plant foods. In general, these are not healthy and should be avoided. Please remember that just because something is “plant-based” or “vegan” does not necessarily mean it is healthy! It is important to remember that the real health benefits that come from following a whole food plant-based diet arise from consuming whole plant foods! The closer you get your food in its original state from the soil, the healthier that food will be. Dr. Michael Gregor’s Daily Dozen is a great place to start for an idea of healthy plant-based foods. Look for fruits, veggies, legumes, nuts, seeds, beans, and whole-grains. Bodai BI, Nakata TE, Wong WT, Clark DR, Lawenda S, Tsou C, Liu R, Shiue L, Cooper N, Rehbein M, Ha BP, Mckeirnan A, Misquitta R, Vij P, Klonecke A, Mejia CS, Dionysian E, Hashmi S, Greger M, Stoll S, Campbell TM. Lifestyle Medicine: A Brief Review of Its Dramatic Impact on Health and Survival. Perm J. 2017;22. Tuso PJ, Ismail MH, Ha BP, Bartolotto C. Nutritional update for physicians: plant-based diets. Perm J. 2013 Spring;17(2):61-6. doi: 10.7812/TPP/12-085. PubMed PMID: 23704846; PubMed Central PMCID: PMC3662288. Satija A, Bhupathiraju SN, Spiegelman D, Chiuve SE, Manson JE, Willett W, Rexrode KM, Rimm EB, Hu FB. Healthful and Unhealthful Plant-Based Diets and the Risk of Coronary Heart Disease in U.S. Adults. J Am Coll Cardiol. 2017 Jul 25;70(4):411-422.